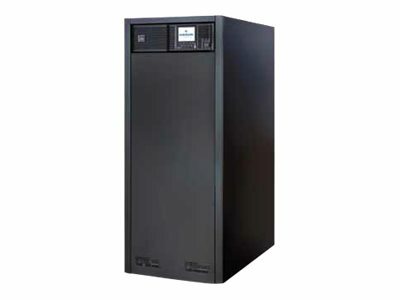 Vertiv NXC 15kVA NO BATT. Liebert NXC offers reliable and flexible secure power in a fully integrated package solution. It comes complete with highly efficient transformer-free double conversion technology allowing it to provide installation and operating cost savings. Liebert NXC is a compact solution designed to optimize installation space requirements and provide enhanced flexibility to ensure superior protection for all load types. Liebert NXC combination of performance features, impressive integrated autonomy and compact footprint make it ideal for guaranteeing clean, continuous power for a wide range of applications from IT, medical facilities and laboratories, office facilities, and retail brands. Liebert NXC offers integrated full galvanic isolation, meaning that an isolation transformer may be housed inside the UPS cabinet. This greatly reduces the system footprint, thus providing space saving advantages. Liebert NXC provides an excellent integrated autonomy which results in back up times of up to one hour. Its spacious internal architecture is able to house up to four battery strings, further optimizing integrated autonomy and delivering the added advantage of virtually eliminating the need for an external battery cabinet. This furthermore reduces installation costs and minimizes the demand on physical space. In addition, Liebert NXC's powerful battery charger (up to 6 kW) ensures rapid recharge, increasing its ability to manage longer back up times. Liebert NXC can be connected with up to four units in parallel. A single unit can be upgraded to parallel operation via easy to modify software settings, allowing the system to be customized for the requested configuration. The Loop BUS connection used in paralleling the system delivers ultimate reliability and eliminates the possibility of a single point of failure, ensuring perfect load sharing and fast detection of any variation in the system status. Furthermore, the output of two single or parallel Liebert NXC units can be synchronized to deploy a dual bus feed, achieving Tier IV level reliability.